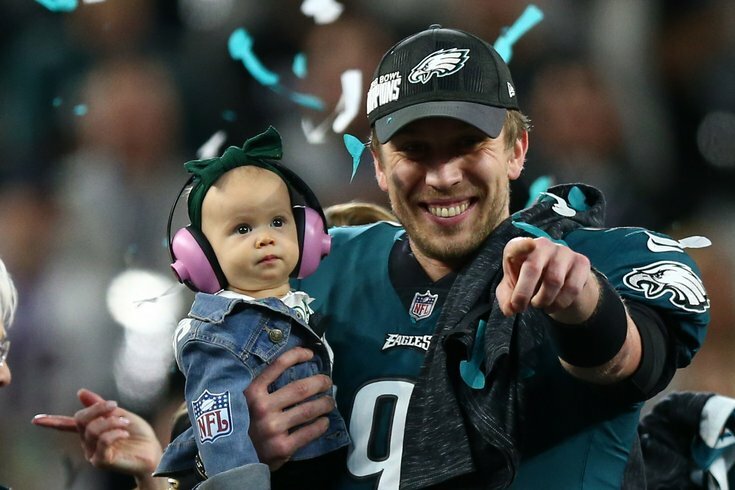 Philadelphia Eagles quarterback Nick Foles celebrates with daughter Lily after defeating the New England Patriots in Super Bowl LII. When Carson Wentz went down in Week 14, many thought the Eagles season was over. Hardly anyone, however, could've predicted what would happen next. Backup quarterback Nick Foles, who not too long ago was considering retirement, stepped in and led the Eagles on a magical run that ended with the city's first Super Bowl title, and its first NFL championship since 1960. And when the dust settled after a wild 41-33 win over the Patriots in Super Bowl LII, it was Foles who was named MVP of the biggest game. The 29-year-old finished with 373 yards, four touchdowns – including a receiving TD on fourth down – and an interception, his only one all postseason. Foles' first touchdown came on this great throw to Alshon Jeffery, who made an unbelievable grab. Then, after a 55-yard completion to Corey Clement on a wheel route, the Eagles offense stalled. But on fourth down, he dialed up a play they call "Philly Special," one they've been working on for a few weeks now, Pederson admitted after the game. "He's an aggressive play-caller, and we all loved it," Foles said of his coach's decision to call the trick play on fourth and goal from the one. Foles' second passing touchdown came on a dime to Clement, the undrafted rookie running back from Glassboro, NJ. His third and final TD wasn't his most difficult pass of the night, but it certainly came at the most critical moment. Foles, who was drafted by the Eagles in the third round of the 2012 NFL Draft, became the first backup quarterback to be named Super Bowl MVP since Tom Brady, his Patriots counterpart on Sunday night, won back in 2001.